28 The Daily Citizen ◆ HOW TO CHOOSE GUIDE 2015 All-terrain vehicles, or ATVs, are a popular vehicle for fun and work. It is a fantastic way to escape the busy week or spend time with your friends. Or, it is a great way to cover ground quickly while you check on crops or animals. Perhaps you're looking for a bit of competition. There are plenty of races and competi- tions around if that is your desire. Unlike many other hobbies, ATVs are a relative bargain. With some basic equipment and gas, you are on your way. Getting started First, conduct some research. Think about how you will use the equipment. Are you using the ATV for competi- tion or strictly recreation? If your goal is to compete, then you will need a higher level of equipment. On the other hand, long excursions demand strong fuel capacity and range. No matter what your goal, you should learn to ride safely and comfortably. Take a training course and always follow local traffic laws. Finding more experienced ATV riders will help you learn more about your vehicle. Joining a local club is an excel- lent way to make new friends and find riding partners. You can also discover local trails and listen to riding tips from experts. Types of ATVs There are several kinds of ATVs to consider. The youth model is smaller and less powerful. With an automatic transmis- sion, it is designed to introduce children to the hobby. The basic four-wheeler is an afford- able choice. It is perfect for the first time ATV owner. These easy-to-ride vehicles are affordable selections, but they are not ideal for deep mud or large rocks. Utility quads will help you with tow- ing, snowplowing or hauling cargo on front-or rear-mounted racks. These ATVs have many other accessories as well. Sport-utility quads have features that will enhance performance and practicality. These ATVs are popular because they are fun to ride. Finally, some ATVs have long-travel suspensions, powerful engines and light- weight construction. These machines are for sports and fun. They can jump, slide and run over rough terrain. Competitions If you are thinking about becoming more involved with ATVs, consider tak- ing part in competitions. From races to endurance rides, you can test your skills. There are even safety competitions. Look for more information at your local ATV club or on the Internet. Safety tips — Purchase an ATV that fits your strength, size and experience. Never let a child ride an ATV designed for an adult. — Wear a helmet designed for ATV riders. Always insist that all members of your crew wear their helmets. — Follow safe towing practices when moving your ATV. — Ask for permission before riding on private land. Decide Choosing the right ATV is a combina- tion of finding what you like, what meets your budget, and what fits you and your experience level. 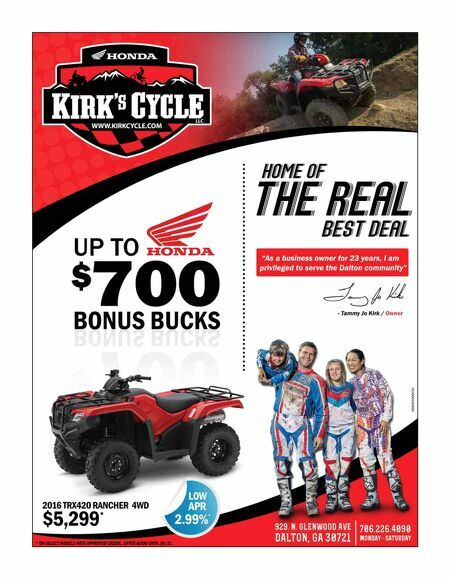 Visit your local ATV reseller to see in person the different types of machines, talk to the experts and get an idea of the prices. Many retailers will also have pro- grams and information on ATV clubs, events and competitions. They are a great source of information for you and your new ATV. H OW TO CHOOSE AN ATV WHAT YOU SHOULD KNOW k j You should consider your goal when researching the different types of ATVs and pick the one that fits best. You can find various kinds of ATV competitions by contacting a local club. k j Being safe with ATVs begins when you purchase the correct ATV for your size and skill level. 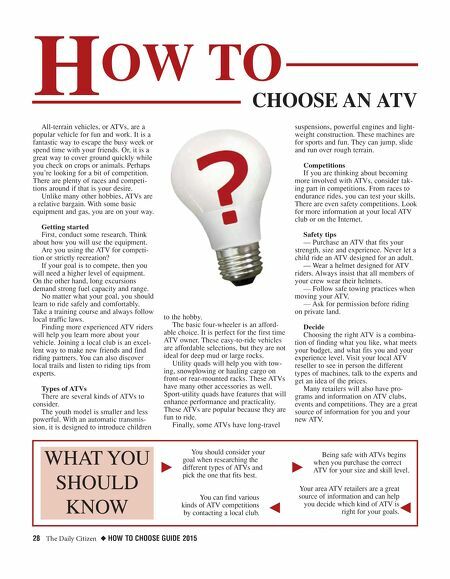 Your area ATV retailers are a great source of information and can help you decide which kind of ATV is right for your goals.